The Ten Commandments is one of the best known parts of the Bible. Even those who don’t read the Bible can list two or three of them. We may have a deep sense that these laws are given so that we will know how to live an upright life before God. False testimony is banned because it will subvert justice; adultery is prohibited because it threatens a multitude of relationships within a community; murder is wrong because it strips another of their right to life. The idea behind these laws is the preservation and building of community. This is the impact of a community that lives out God’s intentions for his people. Their practices of righteousness and justice will demonstrate who he is to the world around them. The Church is called to be this community. As the Church practices God’s ideal as found throughout Scripture, we will inevitably be a people of true justice and a community that reflects God’s holy character to the world. 1. 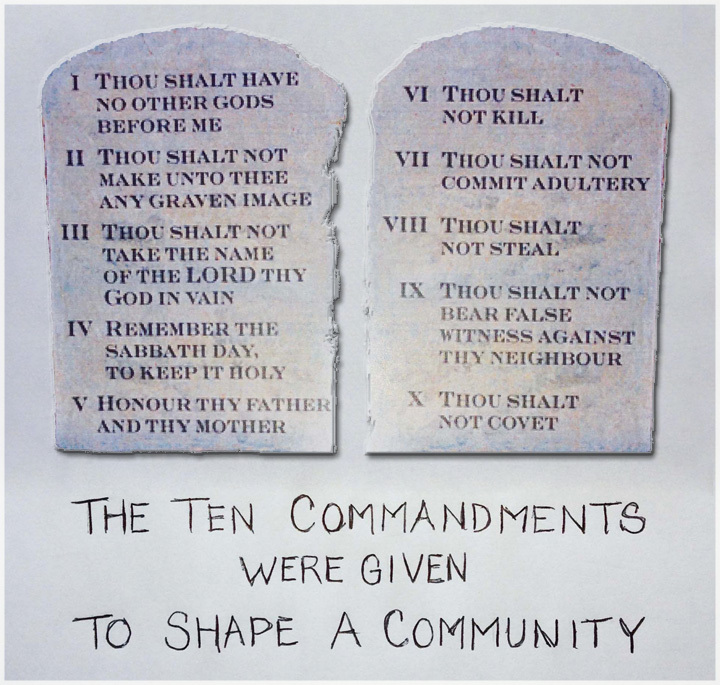 What kind of impact do you think your church would have in the community if your church lived out the communal life as reflected in the Ten Commandments? 2. What does it mean to be a community of true justice?